Our free-of-charge service for you: We change your wheelsets for AC systems! 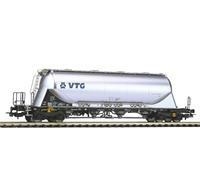 You have a 3 rail AC layout and therefore you need corresponding AC wheels for your PIKO passenger and freight cars? As a free service we give you the opportunity to put the item "ACHSENTAUSCH" into your shopping cart and all the cars of you order will be equipped with the suitable AC wheels. This is a free service without additional costs.